I believed my main parental responsibility was to provide for my family. I focused on work. Rebecca did most of the parenting. Of course I changed the babies diapers at times, and might even get up at night if I heard the baby crying first. However Rebecca handled the childrearing. I remember when Janet, our oldest child, was about 5 or 6. I took her to New York on an outing to celebrate her birthday. It was my Wednesday afternoon off and I wanted her to see New York. She was so pretty. Everyone would stop and admire her. At one point Janet needed to use the bathroom, but of course I couldn't take her. I remember the waitress offering to take her to the bathroom for me. Another family story I remember is Jerry learning to walk. He was very slow to walk. At one point I was encouraging him to walk to me but he wouldn't. In disgust I gave him a whack on the "tuchus" (buttocks) and he started to walk, like he was running away from me. Then he saw he was making progress walking, so he walked out of his own motivation. I don't think it was as much the whack on his behind as it was my loud voice that went with it. When we wanted our children to do something, we gave them directions and they did it. I believe the parent is the boss. After all, the child does as he is told, he goes to school, he brings his report card home, and if it isn't good he gets hell. My children were fine students. They worked hard and studied. Achievement in school was expected. I expected my children to do their homework and work hard. They did. When they brought home a grade and it was 98 or 99 I would jokingly ask, "Did you spell your name wrong?" If they needed help we would help them. I think we were among a minority of Secaucus parents who were concerned about their children's education. We followed the direction of the school and supported whatever the school tried to do for our children. My kids won many prizes at school for good grades. I think it was expected in the community that the Ziskind children would win any prize. All three won the annual Gettysburg Address contest and recited that speech on Memorial Day in the town square. I do not think I was a particularly strict parent. I probably wasn't strict enough because my children had shortcomings, perhaps because I was too lax. I tried to be reasonable and fair and encouraged my children to be the same. However, when I told my children to do something I expected them to do it. I always had a loud voice. My mother used to say I "had too much steam." I think my loud voice impressed my children and they did what they were told. When I raised my voice it got done. While I did not like the idea of spanking a child, I did spank my children when I felt it was necessary. More often I gave them hell with my loud voice. In the heat of anger, I might say, "Go into the next room. Get out of here. I can't stand you," and then chase them away. I might say, "Get upstairs." But these were rare occurrences because I had good kids. They were no problem. My children tell me they thought I was strict. They tell me that I had very high expectations. I would say that there was a reason for everything I expected. When I was on the telephone I expected absolute silence around me, so I could hear the conversation. We ate dinner every night at exactly 5:30 P.M. Families should eat together at a set time. It was reasonable that we finish eating by 6:00 so I could start my evening office hours. My expectations were reasonable and normal. I believed things had to be done right, and if it wasn't I told them so. When they got older, for example, I might expect them to be home by 12 o'clock. If they were late then the next time they would have to be in by 11 o'clock. They would lose some of their control as way of punishment to teach them to meet our expectations. However our kids were good. They obeyed and did not break our rules. I didn't like people talking while I watched or listened to a radio or television show. Our family enjoyed watching a favorite family television show on Saturday nights, Perry Mason. I would buy deli meats from a nearby Jewish delicatessen and we would eat sandwiches and watch the show as a family. Rebecca often chose to eat leftovers rather than the deli sandwiches that the rest of us ate. We typically listened to a radio show on Sundays at lunch, The Eternal Light, which we referred to as The Jewish Story. It was a family ritual. We listened very intently. No one spoke during the broadcast. Afterwards we had a brief discussion when I made sure they understood the significance of the ideas presented. It was one of the few educational experiences available for Jewish children. The children attended Sunday school in Hoboken, New Jersey for their religious education. There were no opportunities in Secaucus and we wanted the children to have some religious training. Otherwise there was minimal exposure to their religious background. I did not attend religious services other than the Jewish High Holidays because there was no convenient place to do so. We attempted to start a synagogue in Secaucus, but only were successful in keeping it open on the High Holidays. When the children were younger we often went to parks for family outings. One of our favorite destinations was a park in West New York, New Jersey. Looking back I wish I could have afforded to do more special activities with my children like taking them to more Broadway shows or baseball games. While we did some of this, I would have liked to enrich their lives by exposing them to more opportunities. I was usually busy or involved with something else. Often the activities I took them to involved free tickets or minimal cost. Certainly in my childhood and youth I did not have many such opportunities. I can remember the only football game I attended when I was in college. I won a contest by coming the closest to guessing the score of the previous game. The seats were on the visiting team's side. My friend Len Sherman and I were the only ones cheering for Penn on that side of the field. Rebecca and I would often go to the theatre. I enjoyed Broadway musicals. Usually we went near the shows' closing date, when the tickets often were cheaper. We had a large collection of the Playbills of the shows we saw. I enjoyed music and usually had the radio on in our home and car. I often listened to Jewish music on records and then tapes. Jewish music interested me, as I understood Yiddish. A favorite of mine was the popularized hit, Bi Mir Bis Du Shoen. We used to count the number of weeks it was a hit at the top of the charts. When Bi Mir Bis Du Shoen was tops for sixteen weeks it felt like a great victory and made me proud of my heritage. I enjoyed listening to phonograph records on what had to be one of the earliest entertainment centers, which we bought about 1950. It was a cabinet, about four feet high, four feet tall, and three feet deep, blond wood with two large doors. We loved the fine cabinet. Inside was one of the first televisions, a Dumont, a record player that played 45's and 78's, and an AM, FM, and short wave radio. We were among the first in Secaucus to have a TV. Neighbors came to our house to see the "fights", boxing matches that were popular in those days. Rebecca and I on occasion would have dinner parties for our friends. I belonged to a men's poker group, which met monthly on Wednesday evenings. I only had morning office hours on Wednesdays so Wednesday afternoons provided a welcome day off. Often Rebecca and I went to the theatre in New York on Wednesdays. Sometimes I would go into New York alone, occasionally to attend veterinary meetings. Once I was looking in a store window and had a conversation in Yiddish with a man standing near me. He was a recent refuge from Germany. He asked me if I was interested in the jewelry in the window display. He told me about some of the possessions he had brought with him from Europe, where he and his family had been quite wealthy, that he sold to the jewelry stores. We arranged to meet periodically and he would bring jewelry or other objects to sell. Over the years I saw him ten or twenty times. I did not have much free time for leisure activities. There was always plenty of work to do. As a child I looked for odd jobs so I could have some money in my pocket. When I was in college any free time I had I would study. As an adult I mostly worked. I never had an interest in politics. I always voted, but that was the extent of my involvement. I was approached on occasion to run for local office in Secaucus, however I never seriously considered doing so. I guess some considered me a prominent citizen; when there were controversial issues in town, politicians would sometimes come to my office to get my opinion. My only direct involvement in local issues was to know who to see if you needed parking or other tickets fixed. 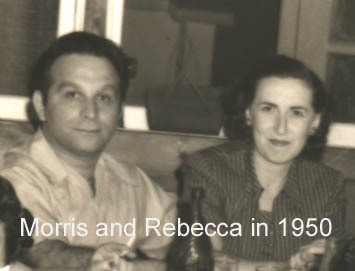 In the early 1950's Rebecca and I wanted a place for our family to spend the summer. We were one of the early buyers in the summer community of White Meadow Lake, New Jersey, about an hour drive from Secaucus. We bought the land and had a summer bungalow built. We summered there a few years. It cost $18 annually for the use of the lake and other facilities. We liked the activities for our kids and it was reasonably close. Like most of the other husbands at While Meadow I was only there for weekends. I would drive to White Meadow on Saturday afternoon after my office hours and return Sunday evening to Secaucus for work during the week. After I arrived I would usually take a nap. I always liked taking an afternoon nap. In Secaucus, when I worked such long hours I learned to take a half hour nap about five PM which would refresh me for my evening office hours. So Saturday night at White Meadow, reenergized by my nap, after my workweek, I might start to work on one of my projects, like finishing the screened porch. I always enjoyed puttering when I had the time. One night one of our neighbors opened up his window and shouted that my hammering was keeping him from sleeping. That was the end of my late night building projects. When the husbands arrived on the weekend neighbor families would eat and party together. I looked forward to the day off I would have in the country. I developed an interest in gardening and enjoyed working in the yard. Our house was high on a hill with a steep slope in front and to the side. I planted small hosta like plants in the shape of a "Z" on the hill. It took many years but eventually it looked very dramatic. Our family went to Philadelphia twice a year for the Jewish Holidays: Passover and the High Holidays (Rosh Hashanah and Yom Kippur). I would close my practice because it was difficult to find anyone to cover for me. Eventually my clients knew that I closed for the Jewish holidays. We did not take many vacations. It was extremely difficult to find anyone to cover the large animal portion of my practice. Small animal veterinarians could close up for a week with no problem, as there were plenty of veterinarians looking for jobs who would be available to cover their practice. However no one wanted to do large animal work. I couldn't close up for a week. I might have a stable with four sick horses. At times I felt the aggravation wasn't worth the effort. When I did close, on my return so much extra work had accumulated I would wonder whether it had been worth it. Sometimes there would be problems from the work done by the veterinarian covering for me. I was always afraid of losing business. The first trip we took was a cruise; I think to Nassau. I had mentioned my idea of taking a cruise at my Poker Group, a group of my friends who monthly got together for poker and conversation. My friend David Klein's wife agreed to watch our children. I got the tickets for the cruise and then told Rebecca. Rebecca was not happy with my arrangements so she asked her sister, Sophia Axelrod to baby-sit our children. We didn't like the idea of leaving the children but we felt it was time. It was our first time to see how others in the world live, that is, take vacations like other people did. When the children got older we did more traveling. We visited Mexico, the Caribbean, and Bermuda. We took a short trip to Europe. We would have traveled much more extensively if I could have arranged for my practice to be covered. We visited Florida where Sophia and Charley Axelrod were then living. While I believed a parent should know where his children are all the time, what they were doing, and who they were doing it with, I also believed you had to let them grow up. A particularly memorable event was letting our youngest daughter at about twelve or thirteen independently attend art classes in New York City. We rehearsed with her how she would travel to the Art School until we felt comfortable that she would not get lost. After all, I myself got lost in New York. Carrie handled it nicely. The first time she went to New York, unknown to her, I followed her in the car. She was very mature in her judgments. One of the difficult times for us as parents was dealing with our son's health. Jerry got sick at about age five. He had a variety of symptoms, including diarrhea, joint pain, and weight loss. We took him to many doctors looking for help. When we couldn't get answers we kept looking. To this day I am convinced that the doctors didn't know what they were talking about. They really knew nothing but they wanted you to believe what they told you. In retrospect it was the older doctors who seemed more knowledgeable and helpful. We searched for answers for years and eventually the doctors more or less agreed on a diagnosis of juvenile arthritis and ulcerative colitis. 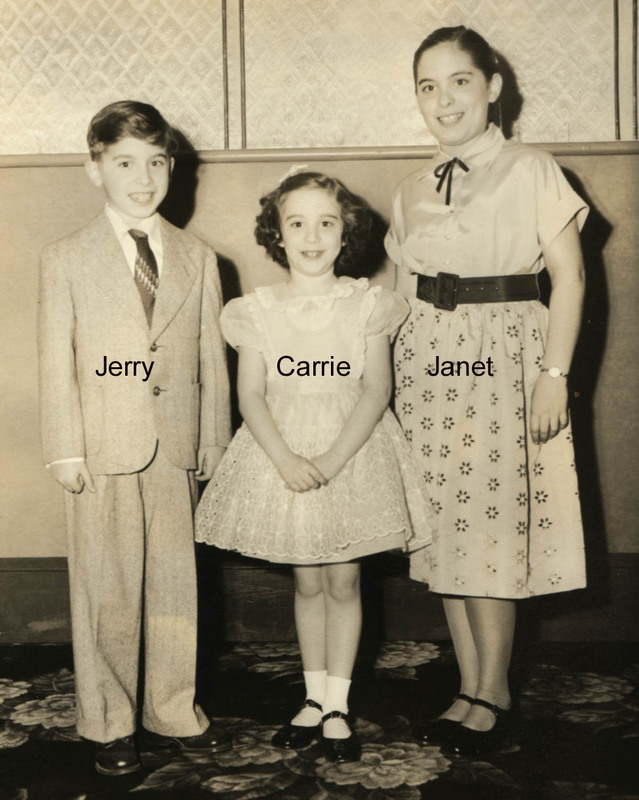 Jerry's health was an ongoing concern for the rest of his childhood. In desperation we tried everything. Each thing we tried cost more. It turned me off medicine and the medical profession. When our children matured each of them went off to college, graduated, got advanced degrees, and went on to meaningful careers. While I would have been happy if they had chosen to settle in Secaucus, we supported them in their decisions. They had minds of their own and we encouraged them to pursue their interests. Years later I had the opportunity to visit my son and observe him teaching in his first grade classroom. I was impressed with the way he ran his class. I was surprised with the sophistication of the discussions and material the children were learning. I enjoyed the questions the children asked me as well. One of the students asked me how much money I earned as a veterinarian. Another asked me, in light of my age, whether I had treated dinosaurs. I was proud of Jerry; even though the career he had chosen was not earning him an adequate living. He told me years later that previous to that visit I had often encouraged him to attend law school, but that after that visit I never mentioned it again. My marriage to Rebecca was a good one. It has lasted over sixty years. If my children asked me for advice about marriage I would tell them to talk out their disagreements and problems. When we had disagreements and were angry we usually stopped talking to each other until the anger wore off. That might be hours or two or three days. Then we would discuss the problem so it wouldn't happen again. I always wanted to know why Rebecca was upset with me. At times that annoyed her. Sometimes we did not discuss the problem, the anger wore off, and the incident was forgotten. We didn't analyze things like they do now: Why? Why? Why? We never argued in front of the children believing it was not good to show disharmony. When it was necessary to discuss something with the children present we might speak in Yiddish. Otherwise we usually waited until the children were in bed. One mistake we made was to take sides in other peoples' arguments. Sometimes we would argue if I wanted to lend someone money and Rebecca disagreed, or vice versa. As a rule I made the decisions about loaning money, which I often did. However if the amount was big enough we might jointly decide. Everyone at times needs capital and if I had it, then I would help out my family or friends. I came from a tradition of people loaning money to help out their friends. My family was part of a "corporation" of family and friends who would make short-term loans of twenty or thirty days. Our "corporation" was a small group of people, mostly family, like the Axelrods, my brother Abe, and other Philadelphia people like the Storicos. These little family groups were a forerunner of banks. For example, if you needed money for your child's college tuition, you would come to the corporation. You would buy shares to become a member of the corporation and then you could borrow, say five hundred dollars. You needed to show you could repay it. The Storicos always were in need to buy supplies for their grocery store. My brother always repaid exactly to the penny. He was scrupulously honest. We never lost any money. We had no formal bookkeeper, however my mother was the secretary, kept the records, and ran the corporation. We only loaned to people we knew and everyone paid back their loans. We did not formally charge interest, but people voluntarily paid back more than they had borrowed to provide capital for future loans. That way we made some money. People couldn't get money for these kinds of needs through a bank. We did not investigate the loan the way a bank would. There was no vote. Our members were all "approved". You got the money right away. The understanding was you only borrowed when you had a need. "You need it. I have it. Here I'll lend it to you." The corporation had a capitalization of about two thousand dollars, and it usually was in circulation. Sometimes we had to say that we can't give you a loan this week, but we expect a repayment on another loan in a few weeks and then we can loan it to you. In that way we helped each other out. Originally there were seven members. Many of the people who borrowed from the corporation became members. It grew to include more than just family. After a few of the members died and we got down to about five, the corporation worked less formally and then stopped functioning. People were more prosperous and there was no need for borrowing the money. While I was gradually becoming prosperous it took years before I really felt prosperous. I was always preparing and saving for the future. By the time I would pay my bills and meet the costs of running a veterinary practice it felt like there was only a little left. In retrospect one could say I am a product of the depression. It always felt like bad times and I never felt totally relaxed about money. Yet I was confident because I had a good job. Eventually my veterinary practice grew to the point that I felt economically comfortable.